MEDIPEP features a unique combination of iLAB's proprietary peptide ingredients, L-ascorbic acid, tyrosine, and other major formulas from the industry's leading laboratories, which work synergistically to stimulate the production of collagen in the skin, reduce the appearance of fine lines and crow’s feet, and help prevent the breakdown of collagen, which leads to aging of the skin. Our high level medi-esthetic grade formulations can be used by both men and women without fear of reactions such as sunlight sensitivity. 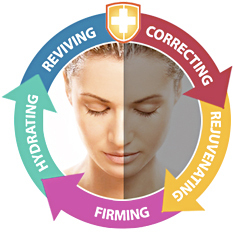 Generally, improvement in the skin can be seen within 2 to 4 weeks of daily use.